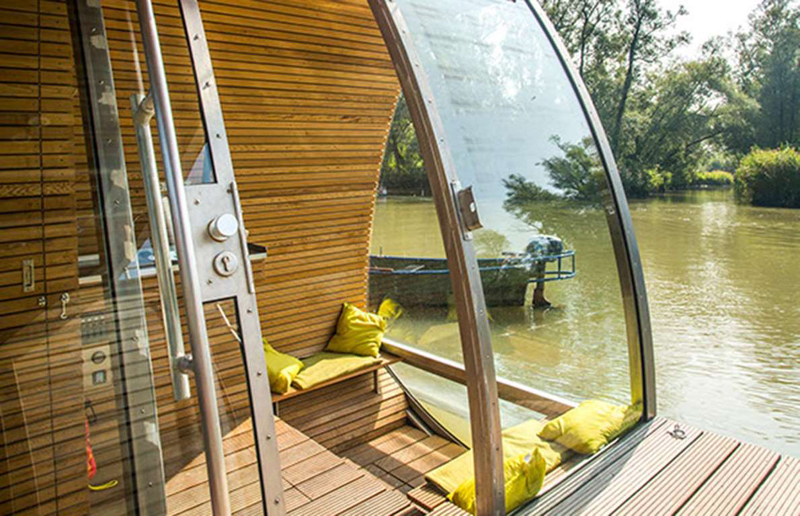 There’s nothing quite like waking up to waterside views, and these beautiful properties offer the tranquil experience of living on the water along with the simplicity of a tiny home. Intrigued? 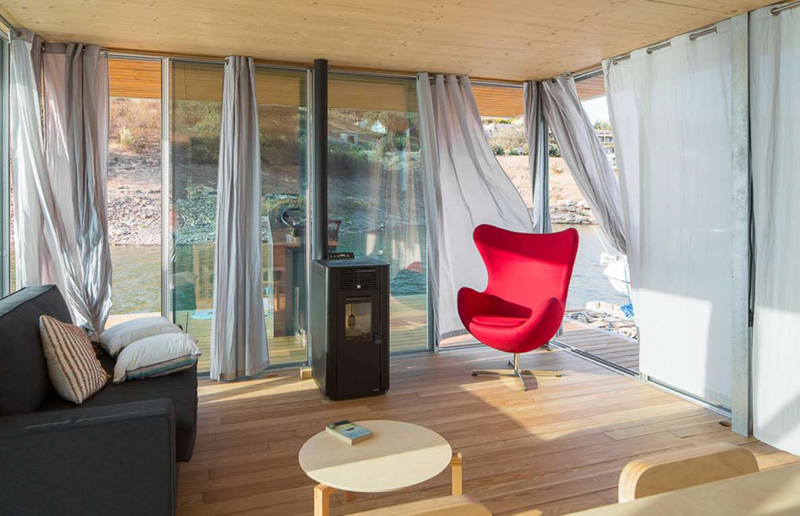 There’s nothing quite like waking up to waterside views, and these beautiful properties offer the tranquil experience of living on the water along with the simplicity of a tiny home. 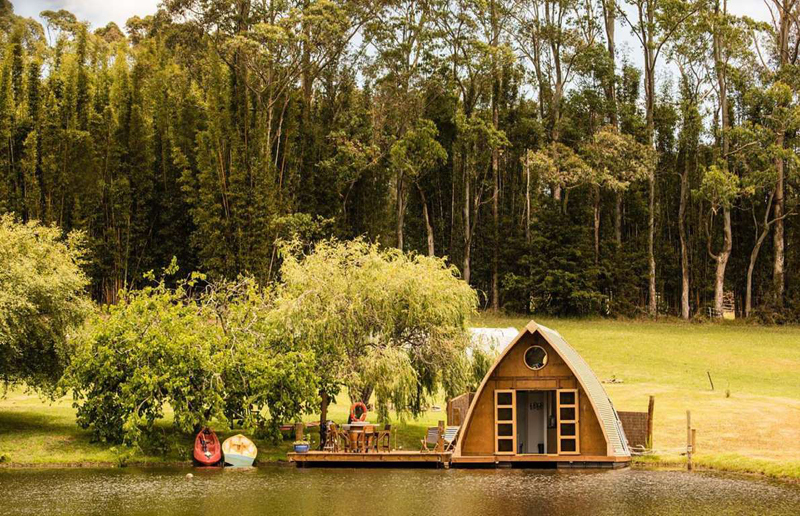 There’s living off-grid, and then there’s living in a tiny floating cabin in a dam in rural New Zealand. 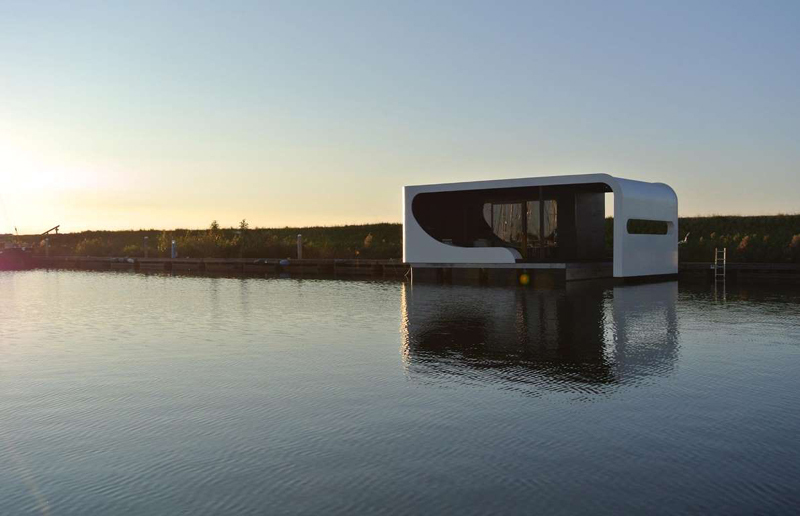 For owners Careena and Chris, building this compact floating house, which they now rent out as holiday accommodation, was the perfect escape from city life. 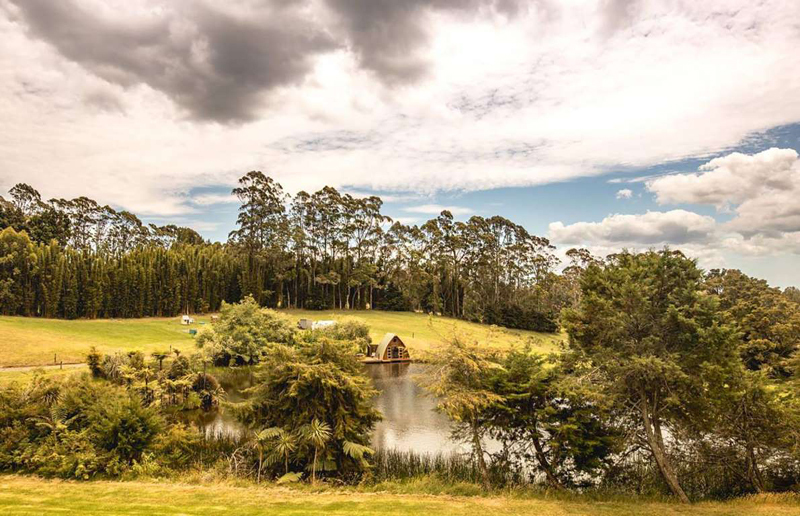 They moved from Auckland to Kerikeri in 2016, and they haven’t looked back since. After buying a plot of land in Northland which included a spring-fed dam, the couple ordered this pre-fabricated tiny home, which was built in the space of 10 days. It’s constructed on top of pontoons and is attached to the land by a wooden deck, which is home to a seating area and water sports equipment. Inside, there’s everything you could need: the open-plan living room/kitchen has a two-ring gas hob, sink, fridge/freezer, ample storage and a dining table. The side of the home is covered in solar panels for electricity, while a bilge pump provides clean running water to taps and showers. 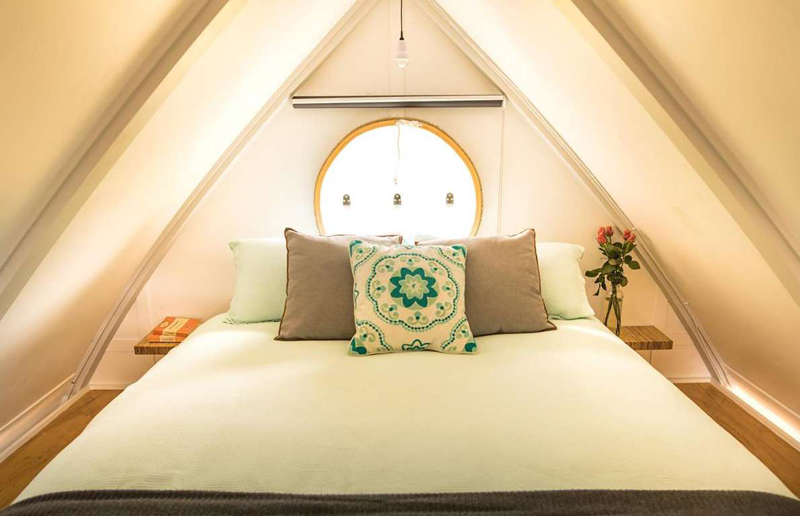 Upstairs, the sleeping quarters are cozy with just enough space for a double bed. The bedroom is accessed by a staircase that drops down from the ceiling and can be shut away to maximize the floor space below. Whether or not you think living on the water is for you, there’s no denying how idyllic this home is. 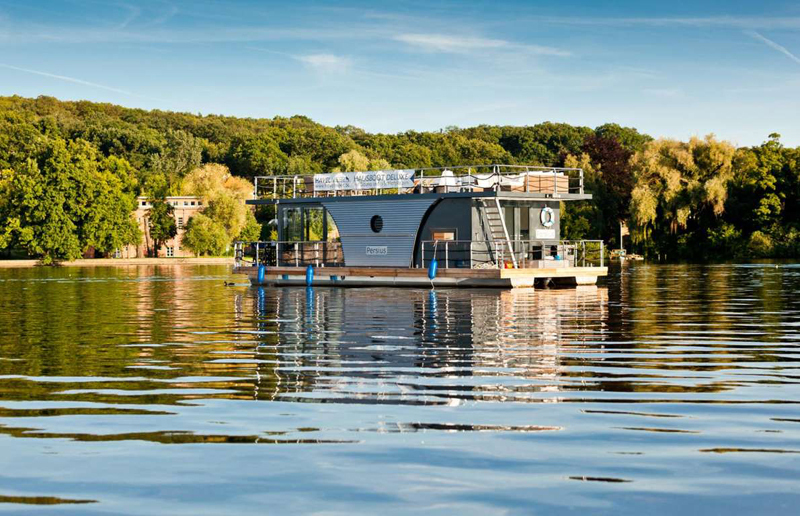 German company Nautilus has created the perfect hybrid between a floating home and a houseboat with the Vagabund Hausboote. Offering the mobility of a boat, with the appearance and layout of a home, this attractive property is perfect for keen seafarers wishing to take the leap into tiny-home living. There's a surprising amount of room inside. The comfortable living area includes a corner sofa, dining table, and floor-to-ceiling windows perfect for gazing out to sea. Out on the deck, there’s plenty of room for dining alfresco or for diving off into the water. 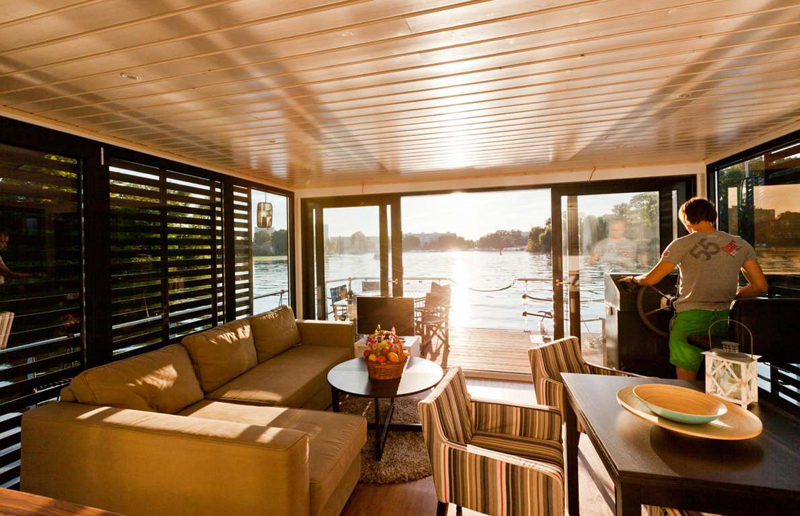 The houseboat puts emphasis on time spent outdoors, and the spacious upper deck provides yet more space for socializing, dining and sunbathing in the open air. 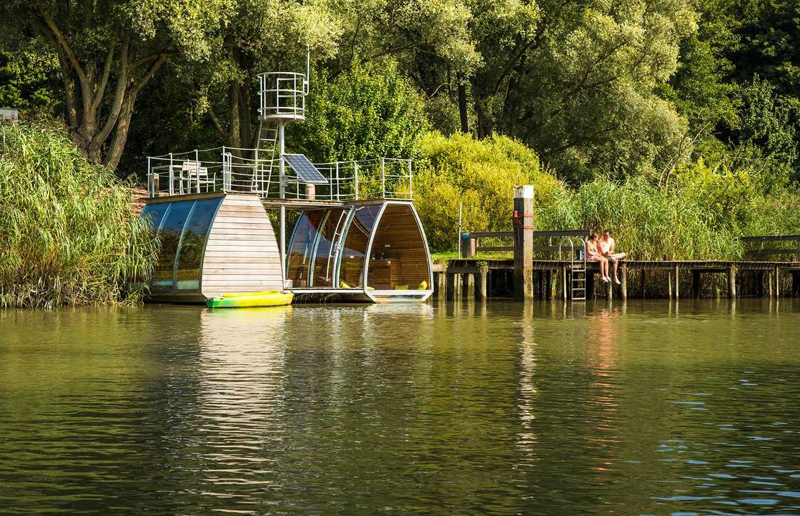 It's intended for use as a holiday rental, but we reckon the property would function perfectly well as a permanent floating home too. 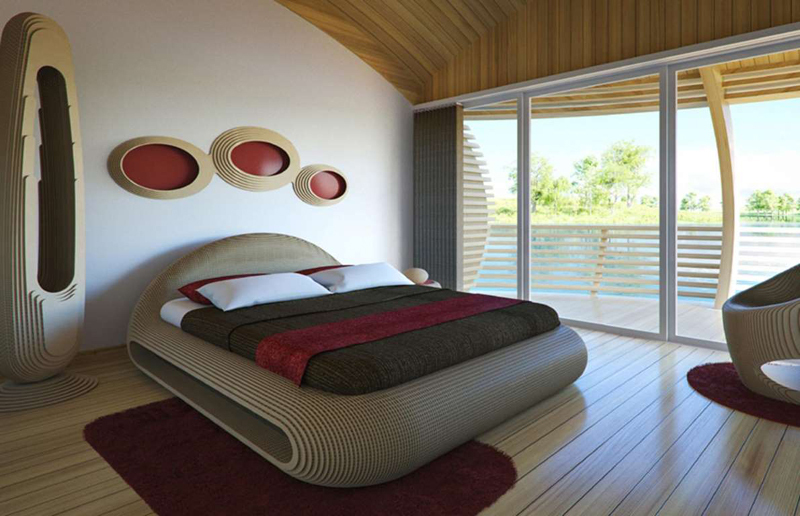 From cutting-edge firm Carl Turner Architects comes this sleek, streamlined floating abode. 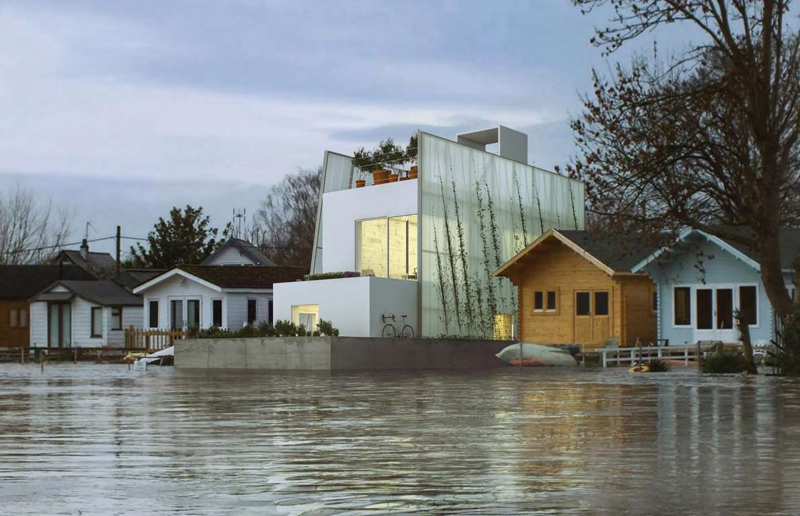 The architects wished to create a property that could address the problem of climate change-induced flooding "at its roots", by making use of unused space in waterways and providing a sustainable living solution for the future. Not only is it beautifully designed, but it’s also extremely eco-friendly. The property has semi-transparent PV solar panels to generate electricity, a rainwater harvesting tank to provide non-drinking water, and floating allotments for growing food crops. This allows homeowners to live a self-sufficient, low-impact life. It's equally attractive on the inside as it is on the outside, featuring minimalist decor with light wooden walls and ceilings, plus matte, slate-gray kitchen worktops. The PV solar panels allow light to spill in while still maintaining privacy. There are also large windows at either end of the property, ideal for gazing out at the horizon. 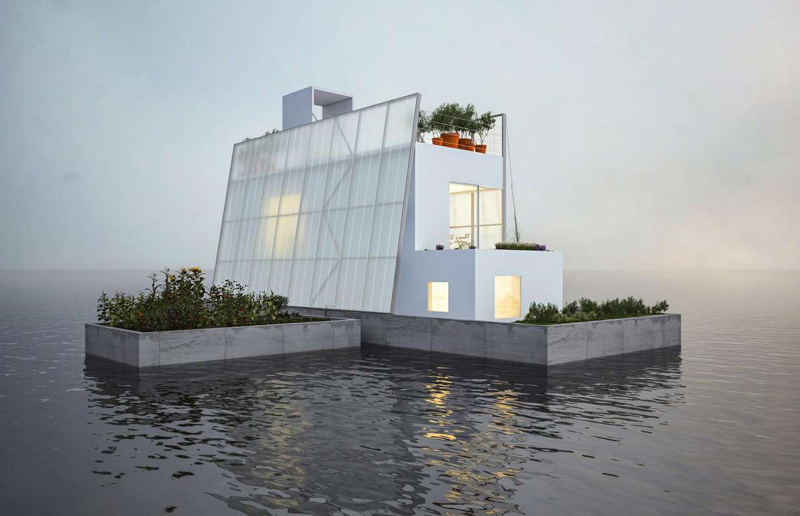 If you’ve got your eye on this unusual waterborne house, you’re in luck – the plans can be downloaded for free online, adapted and built from there. 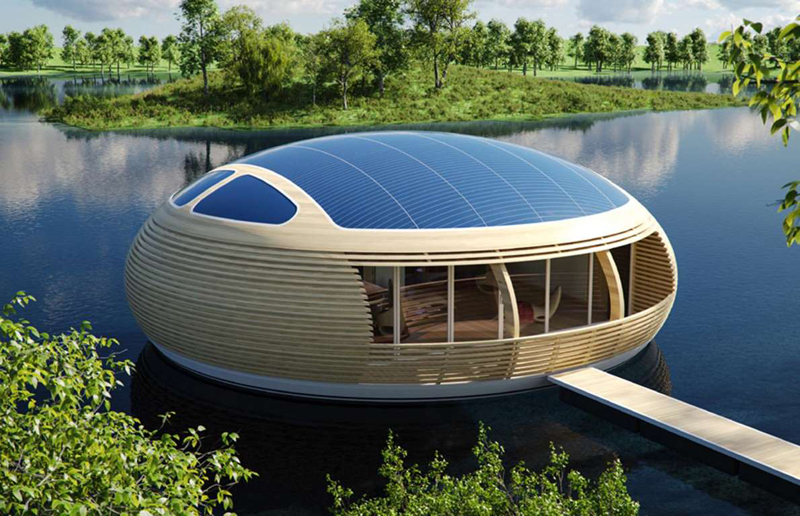 For anyone searching for the perfect eco home, this might just be the answer to your prayers. In search of more eco homes? 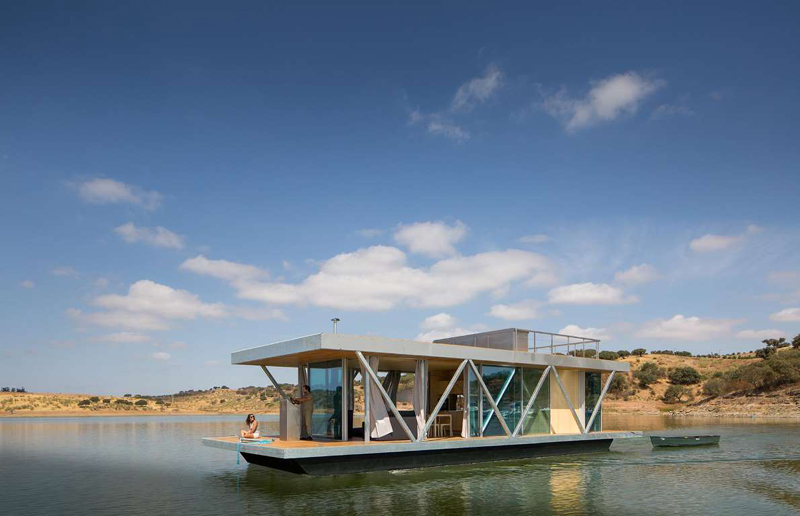 Go Friday’s modern waterborne pad is a sight to behold. 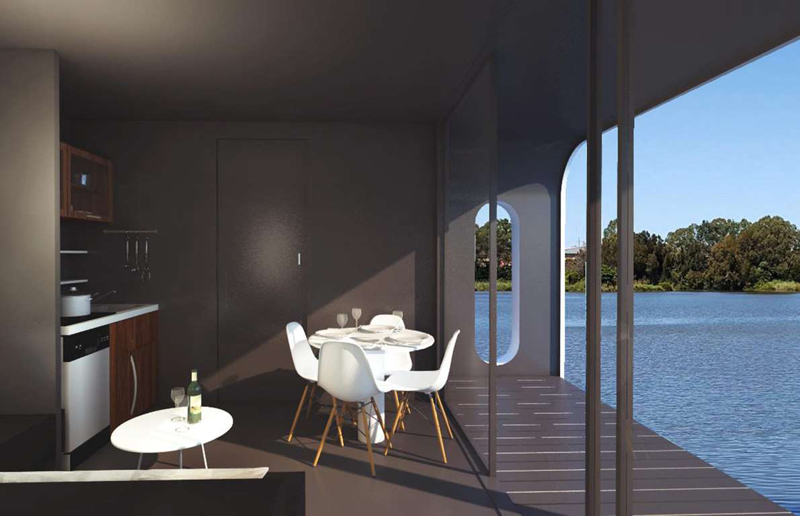 The customizable modular interior features anything from 300 to 560 square feet of living space with up to three bedrooms, plus upper and lower platforms for making the most out of living on the water. 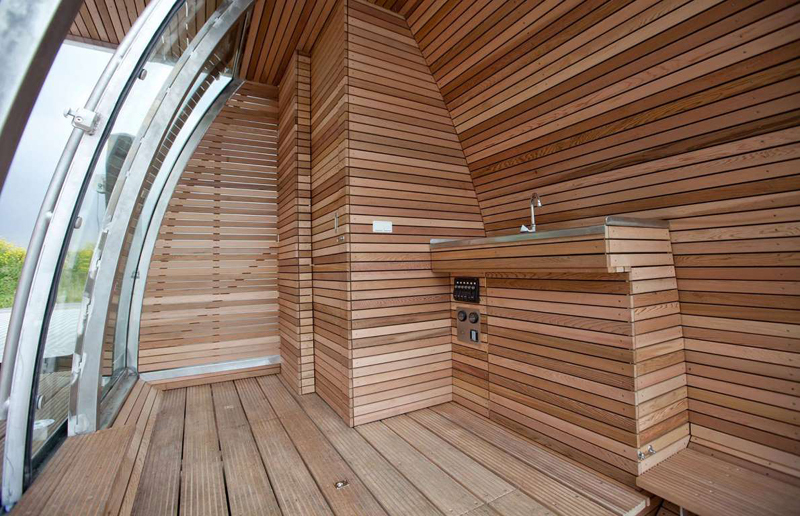 The houseboat can be tailored to your needs. A basic version provides the comfort of a home but with limited mobility, meaning it must be tied to a nearby bank in order to connect to municipal networks. Meanwhile, the most advanced version sees the home equipped with photovoltaic solar panels, so that it’s energy self-sufficient for up to six months at a time. 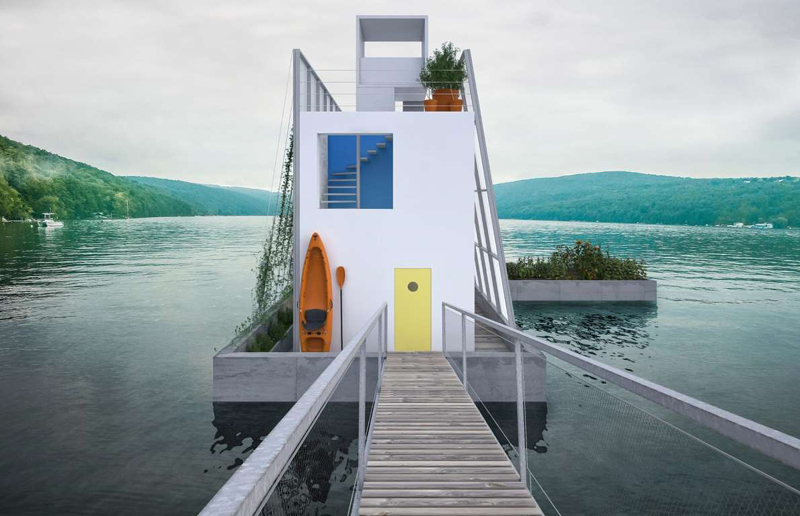 The unusual floating home is intended for use as a holiday home, but it has all the features you'd need to make it a more permanent residence. In all its configurations, it includes a living room with an incorporated kitchen, a basement for electrical equipment and a rooftop for outdoor socializing. 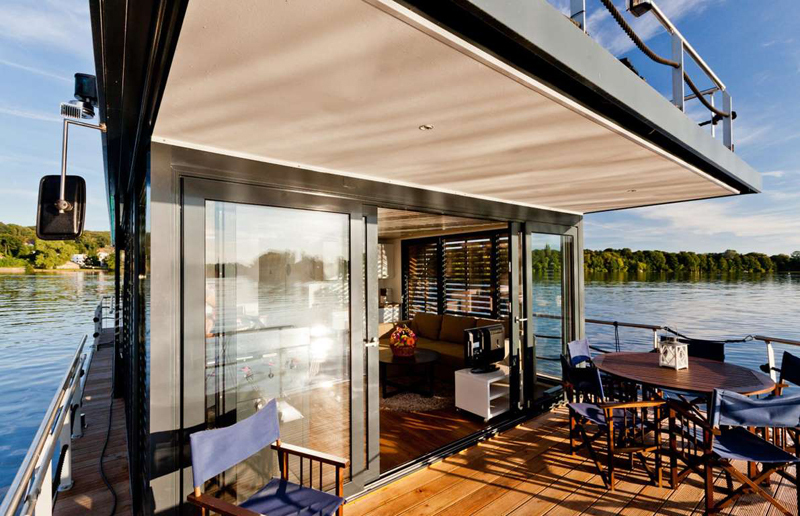 We wouldn’t mind escaping to this gorgeous houseboat, gazing out at the horizon through its glass walls and sunbathing on the deck. Love this? This modern lodge, comprised of two pods, is unlike any we've ever seen. 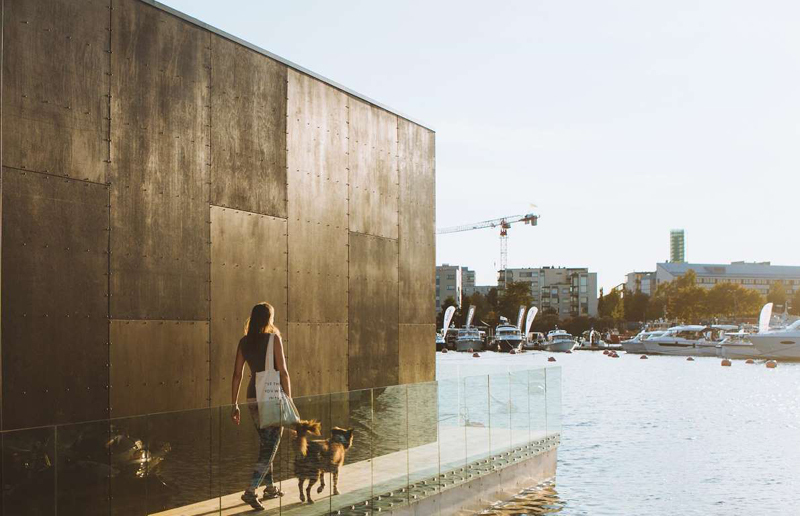 The pods are joined at the base and at the top by decks that provide outdoor space, so it's the perfect spot to enjoy waterside living to the full. Inside, wooden finishes and a curved glass exterior make for a stylish Scandi look. 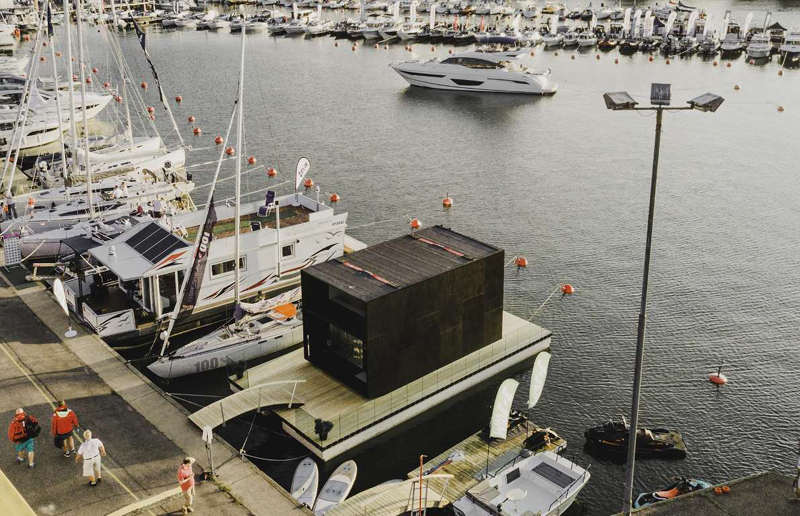 It may be small, but this oasis on water includes all the basics, with a kitchen, toilet, shower and sleeping space for four to be found on board. The lodge, which was originally designed by architect Marijn Beije for visitors to national parks in the Netherlands, is intended to allow people to connect with nature. With a design that emphasises panoramic views and boasts spacious outdoor areas, Beije has definitely achieved his goal. We'd jump at the chance to float off on this mini island. 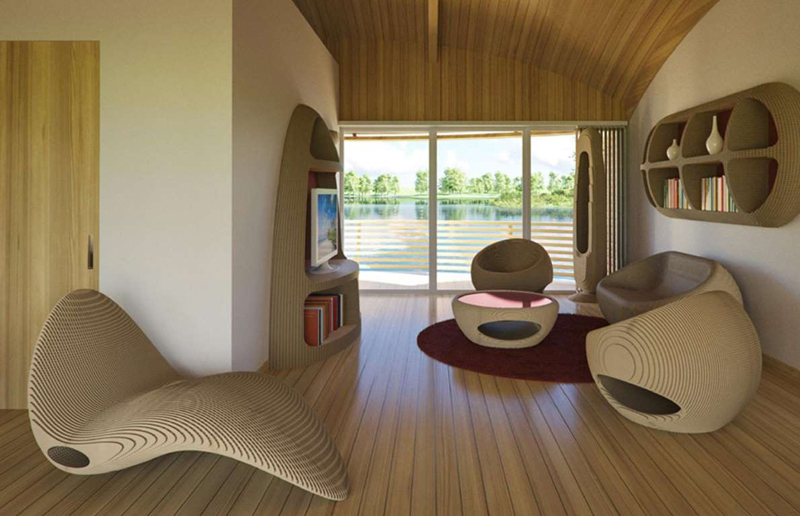 The sweeping, curved shape of this gorgeous modern property is what sets it apart from other floating homes. 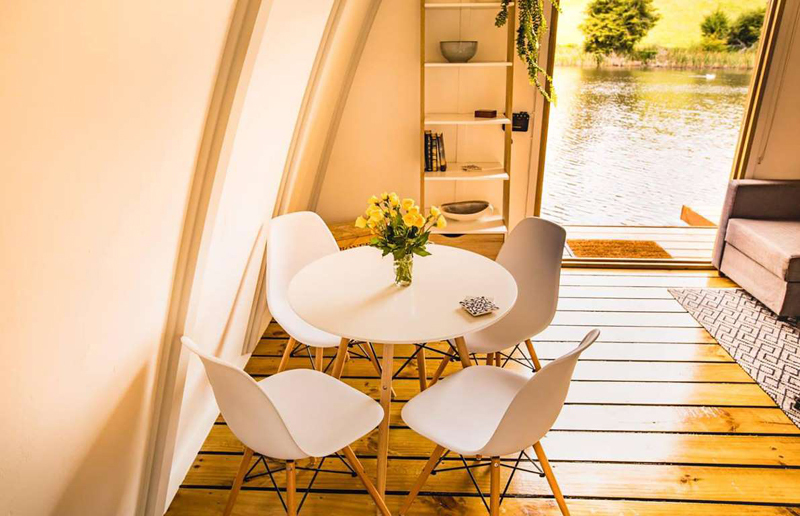 Designed by vacation-home company Tiny Floats, their smallest model, Tiny One, provides 194 square feet of floor space, making it ideal for use as a holiday home or as a dinky house for one. 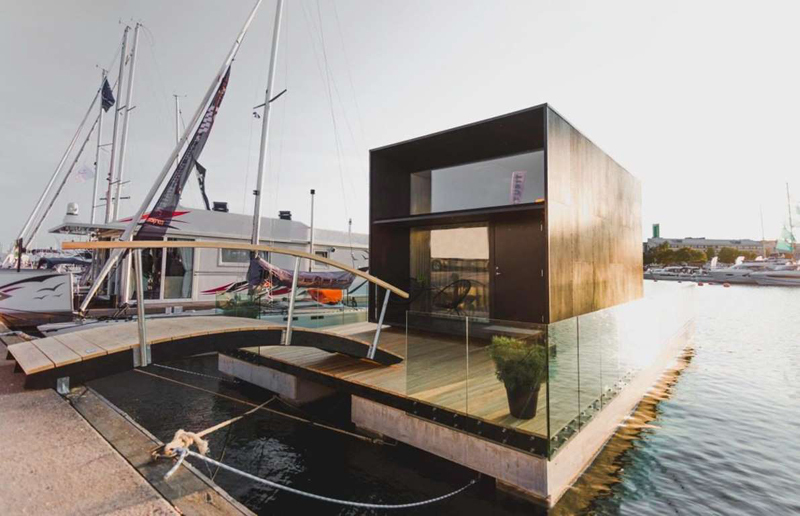 There's nothing cramped about this luxury floating apartment, and that's partly thanks to the clever use of exterior space. 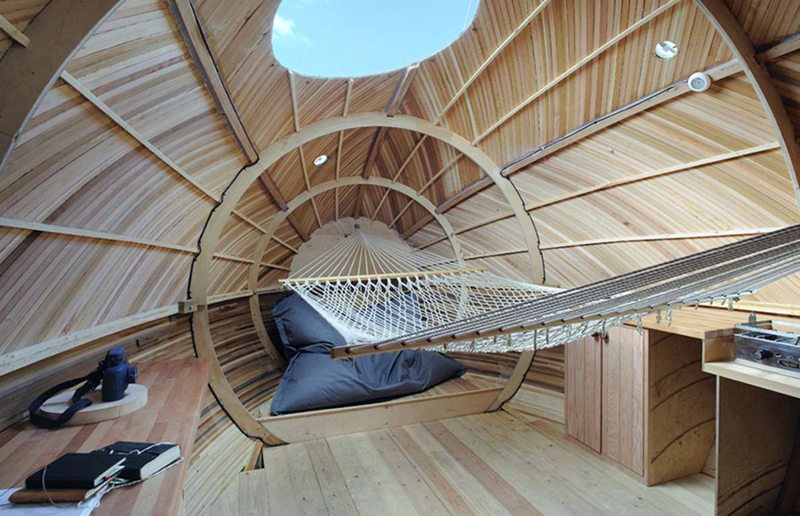 The outer section includes a curved seat, which looks like the ideal spot to curl up with a good book. For a spot of alfresco dining, there's plenty of room for a table and chairs outside on the deck. Subtle design features make a huge difference to this property. For example, the house sits low on the water, allowing for optimum views, while its Polyurea and glass exterior gives it a slightly industrial vibe. Plus, it's got everything you could need, with a small bedroom, kitchen, dining/living areas and a large terrace. Want more inspiration? 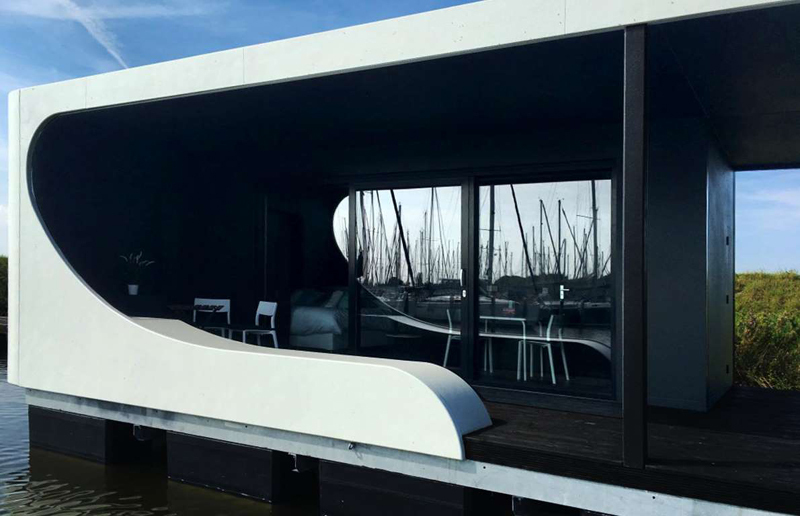 If you're a fan of pre-fab buildings and you want to live on the water, this floating tiny home – a collaboration between architecture firm Kodasema and marina solutions company Top Marine – ticks all boxes. It's both urban yet close to nature; sustainable yet luxurious; and small yet surprisingly spacious. 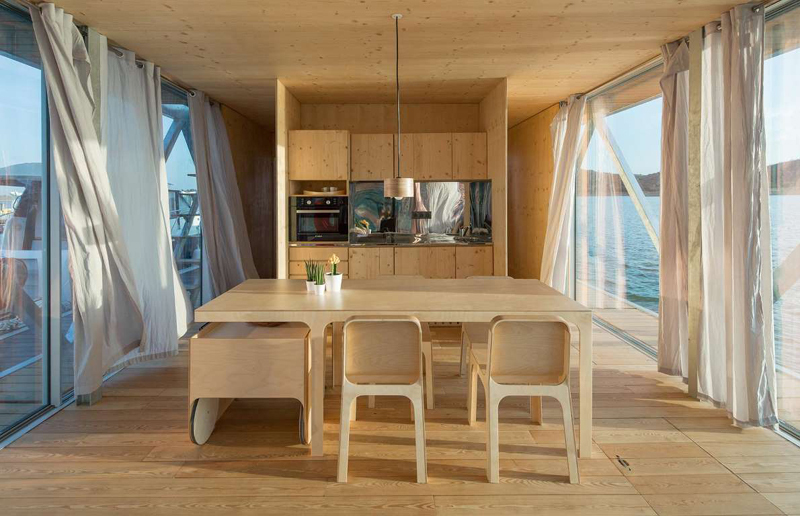 The KODA Light Float can be constructed in a number of materials, from plywood to timber and spruce to pine. Step inside and there's a roomy 277 square feet of floor space spread out over two levels, making it perfect for über-minimalists and those looking for the perfect holiday home. 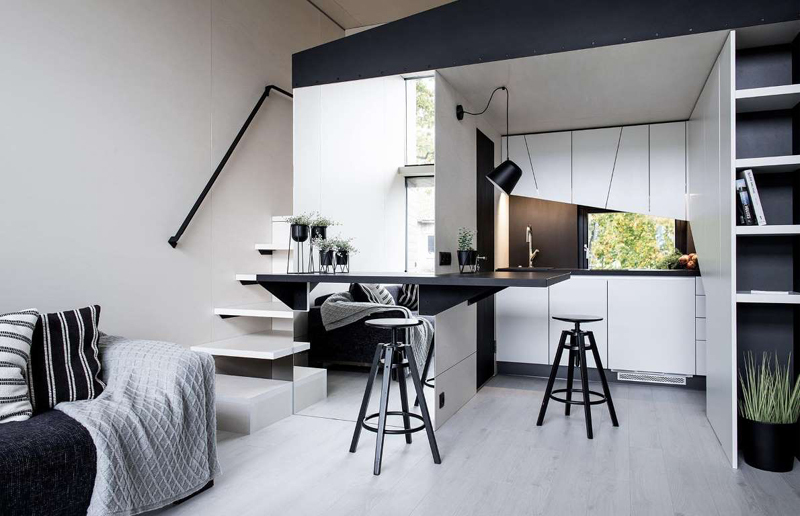 A simpler life is one of the major draws of living small, so it's no surprise that this interior has been decked out in a minimalist, monochrome scheme. Yet with a cozy sofa, small kitchen and breakfast bar, this interior doesn't scrimp on creature comforts either. While its vibe is more 'luxury urban getaway' than 'off-grid tiny home', there's no reason why you couldn't live in this property full-time. It's equipped with underfloor heating, an electric boiler and sewage and water connection, and presents a great way to escape busy city life. 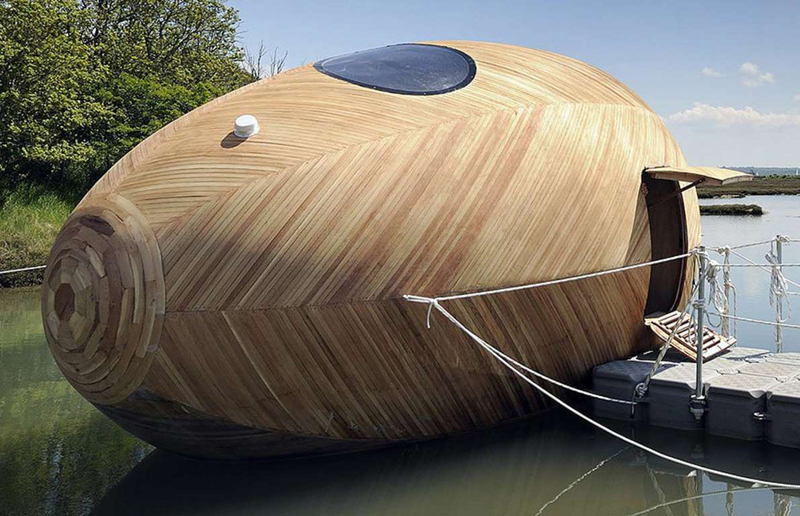 Of all the ways to escape the rat race, designing a floating wooden 'egg' and living in it for a year probably isn’t the first thing that springs to mind. 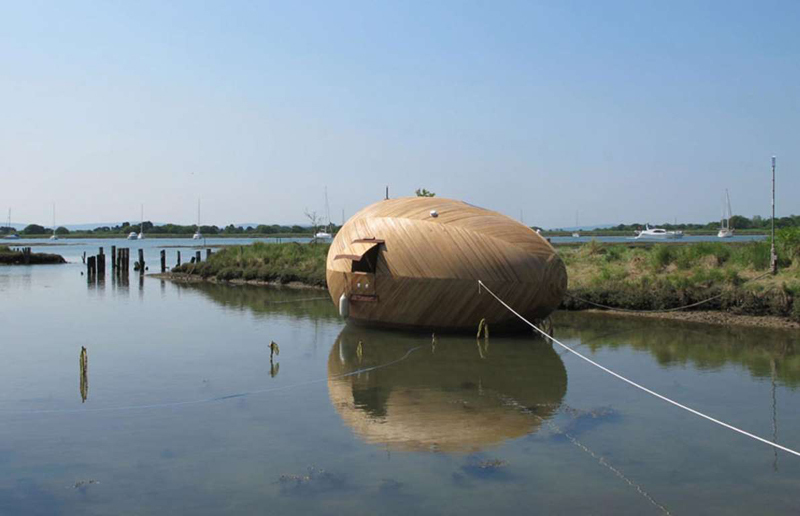 Yet that’s exactly what artist Stephen Turner decided to do when he designed the Exbury Egg. The wooden structure, which was built by architect Paul Baker, was originally located at the estuary of the River Beaulieu. The Egg was "tethered like a boat" and Turner used it as his base for a year, measuring the tides and creating artwork, as well as eating and sleeping here. 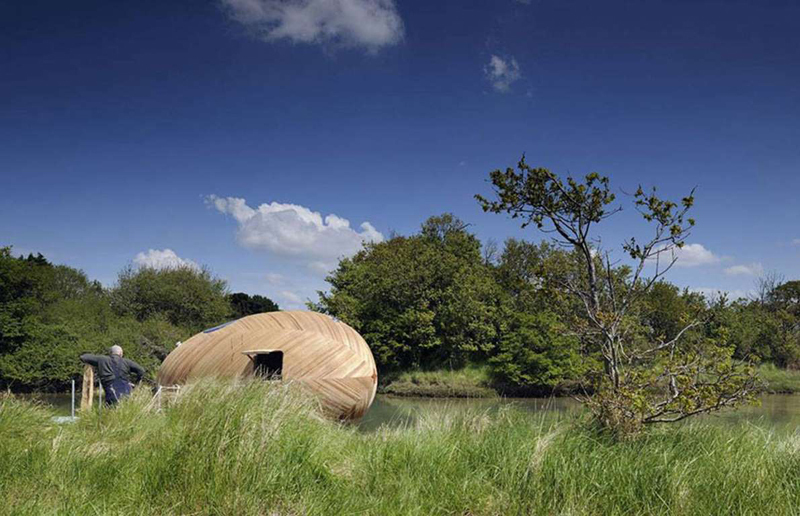 The pared-back design of the Exbury Egg pushes the boundaries of human comfort and architectural possibility. When it comes to living off-grid and reconnecting with nature, it seems Stephen Turner has ‘cracked’ it. 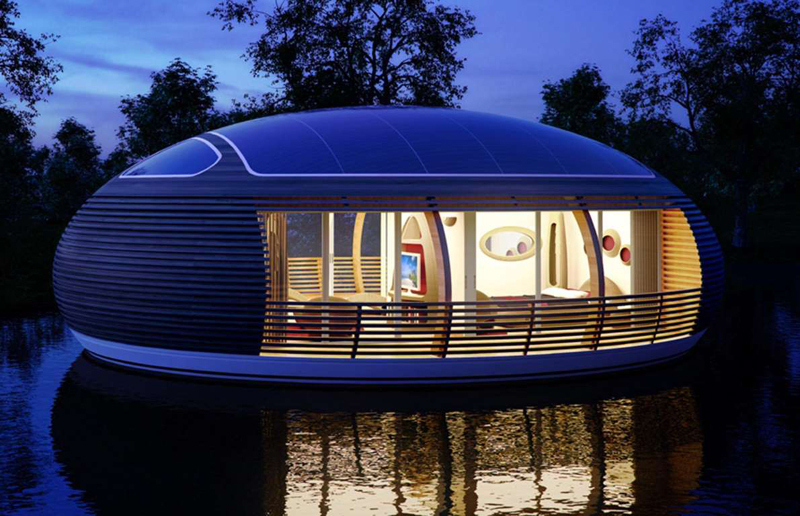 The jewel in the crown of tiny floating homes, this futuristic-looking orb puts paid to the idea that living in a houseboat can't be a luxury. The home boasts a generous 1,076 square feet of floor space, while the roof is covered in solar panels catering to all the property's energy needs. 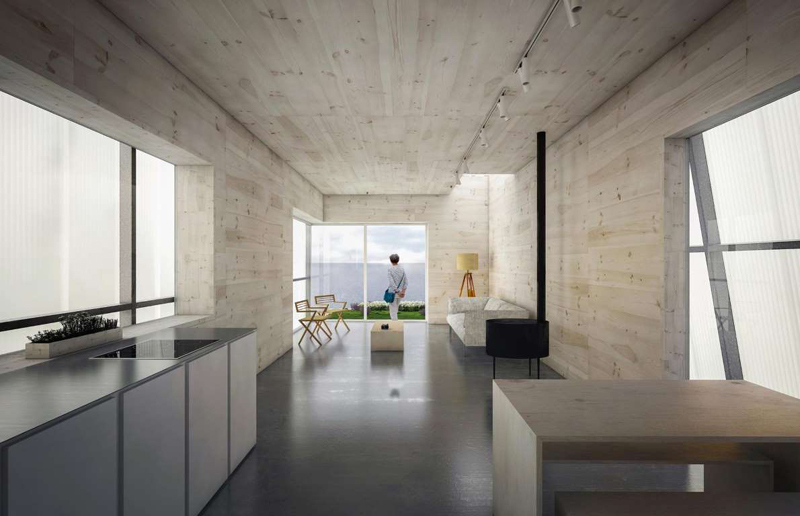 The interior places an emphasis on sustainability with furniture made from cardboard, recycled wooden flooring, and micro-ventilation to ensure low energy use. In total, the abode is created from 98% recycled materials, proving that sustainability needn't come at the cost of having all the mod cons. It was developed by Italian architect Giancarlo Zema for EcoFloLife, who said that the design was inspired by the water nests of birds who live in complete harmony with nature. It's also available in two smaller sizes – 649 square feet and 861 square feet – with homes taking a year to be built to order. Some might argue that calling this impressive property a tiny home is a push (most 'tiny homes' have less than 500 square feet of floor space). But the property gets major points for its clever use of space, its eco credentials and its uber-chic design.